A U.S. citizen appeared Thursday in federal court on charges of joining al Qaeda and conspiring to bomb European tourist resorts and U.S. government facilities and military bases overseas. The investigation of Christopher Paul, 43, of Columbus, spanned four years, three continents and at least eight countries, FBI agent Tim Murphy said Thursday at an earlier media briefing. Paul trained with al Qaeda in the early 1990s overseas and told al Qaeda members in Pakistan and Afghanistan that he was dedicated to committing violent jihad, the indictment issued Wednesday by a federal grand jury said. Paul, who was arrested Wednesday outside his apartment, is charged with providing material support to terrorists, conspiracy to provide support to terrorists and conspiracy to use a weapon of mass destruction. The weapon of mass destruction charge carries the most serious penalty, up to life in prison. Magistrate Judge Terence Kemp asked Paul if he understood the charges in court, and Paul said, "yes, sir." Prosecutors asked that Paul be held without bond, and Kemp set another hearing Friday on the issue. "The indictment of Christopher Paul paints a disturbing picture of an American who traveled overseas to train as a violent jihadist, joined the ranks of al Qaeda and provided military instruction and support to radial cohorts both here and abroad," Assistant U.S. Attorney General Kenneth Wainstein said in a statement. Paul traveled to Germany about April 1999 to train co-conspirators to use explosives to attack European and American targets, including government buildings and vacation spots frequented by American tourists, the document said. It does not address specific resorts or buildings that might have been targeted, but it gives U.S. embassies, military bases and consular premises in Europe as examples. He later sent a wire transfer of $1,760 from a financial institution in the U.S. to an alleged co-conspirator in Germany, prosecutors allege. Paul's attorney, Don Wolery, declined comment after the hearing. A friend of Paul's, Hisham Jenhawi, 32, of Columbus, said he found the charges hard to believe. "I don't think it's even close to his personality to act upon something like that," he said at the courthouse. "He's a very kind person. You would meet him on the street and he would want to hug you with the heart that he has." Jenhawi gave Paul's wife a ride to the hearing but said he did not know her name. The woman declined comment. Paul and Jenhawi, who have known each other about a year, live in the same neighborhood, attend the same mosque and their daughters play together, Jenhawi said. Paul's daughter is about 9 years old and is home-schooled, he said. Paul is married to a woman named in the indictment as F. Bashir, investigators said. Authorities seized a letter from Paul's apartment that he sent to Bashir, according to the indictment. After finishing his al Qaeda training in the early 1990s, Paul returned to Columbus to teach martial arts at a mosque, the indictment said. A fax machine in Paul's residence contained names, phone numbers and contact information for key al Qaeda leadership and associates, the indictment says. Paul's sister, Sandra Laws, answered the door at the two-story, pale green home and said she and her father, Ernest, live there. She said the family will be speaking to Paul's attorney later Thursday and declined further comment. No charges are expected against family members, authorities said. Paul was born Paul Kenyatta Laws, and legally changed his name to Abdulmalek Kenyatta in 1989, then to Christopher Paul in 1994, the indictment said. Overall, 10 different names are listed for Paul on the indictment. Two other Columbus men have been charged in federal investigators' terrorism investigation. 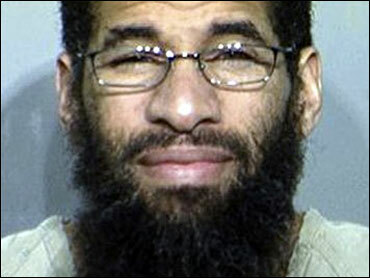 Iyman Faris was sentenced in 2003 to 20 years in prison for a plot to topple the Brooklyn Bridge. Nuradin Abdi, accused of plotting to blow up a Columbus-area shopping mall, is awaiting trial on charges including conspiring to aid terrorists.